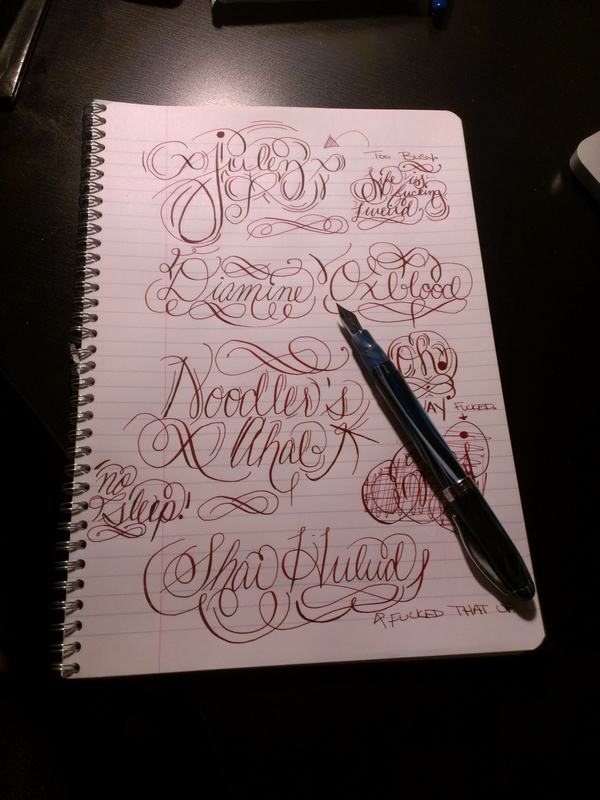 Notes: This was definitely my most used pen/ink combination of the week. You can check out the other stuff I’ve been using over in the Weekly Loadout section. I recently got fed up with the Ahab not working, and started tweaking. I shortened the tube that goes into the feed inside the converter, and increased the bore that it goes into. 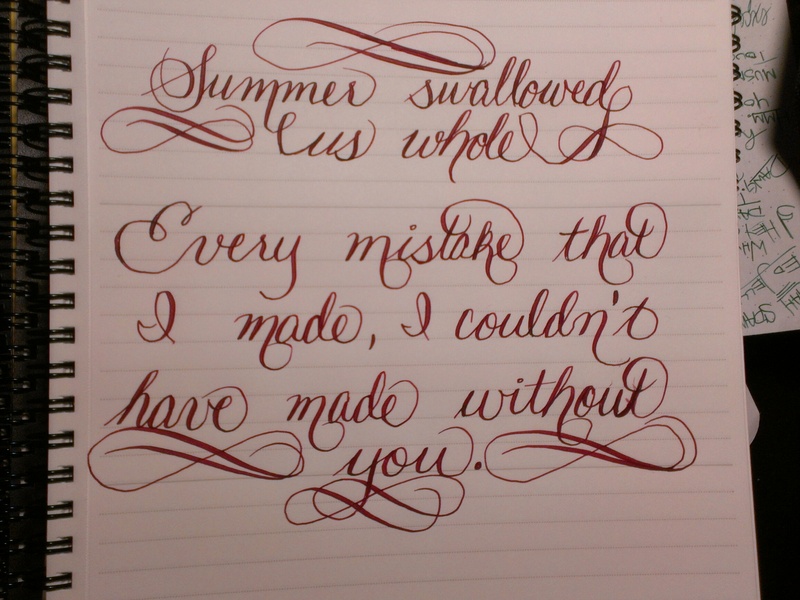 I carved out the channel with a razor blade a bit, and properly adjusted the nib. Now, this thing works wonderfully. It definitely didn’t before. Now, onto the ink. 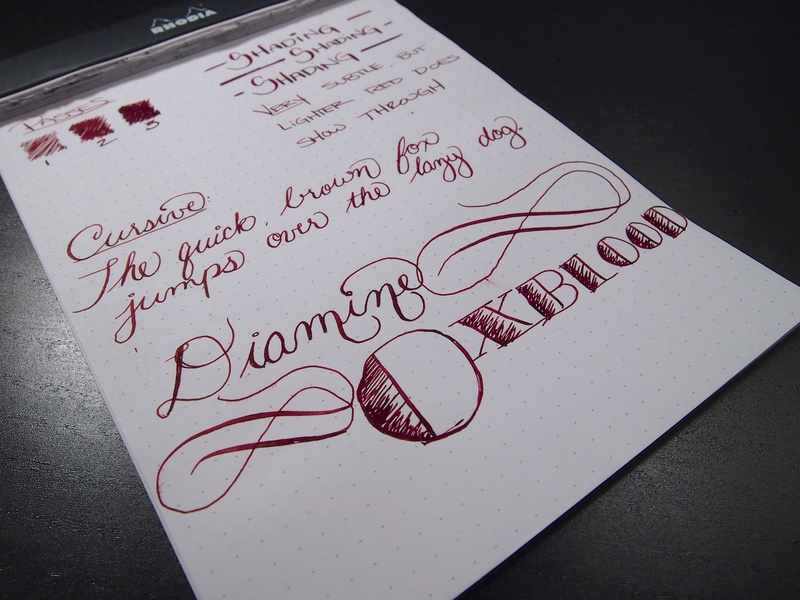 Diamine Oxblood is probably my favorite ink of all time. The name suits it perfectly. It’s got that deep reddish brown tinge that reminds me of dried blood. It’s well behaved, cleans out relatively easily, and dried quick. I’ve gone through two converters full this week alone. 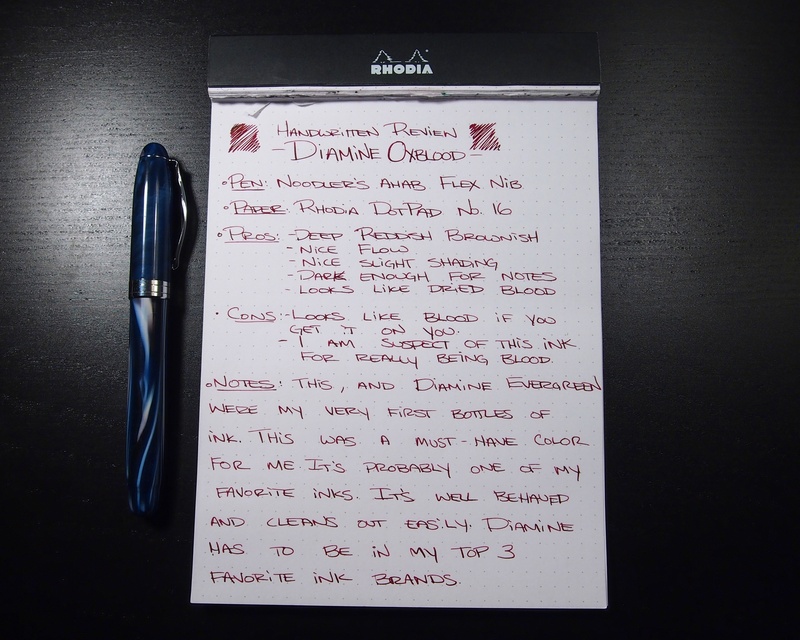 This ink usually has a permanent spot in my daily carry. Enjoy the review! 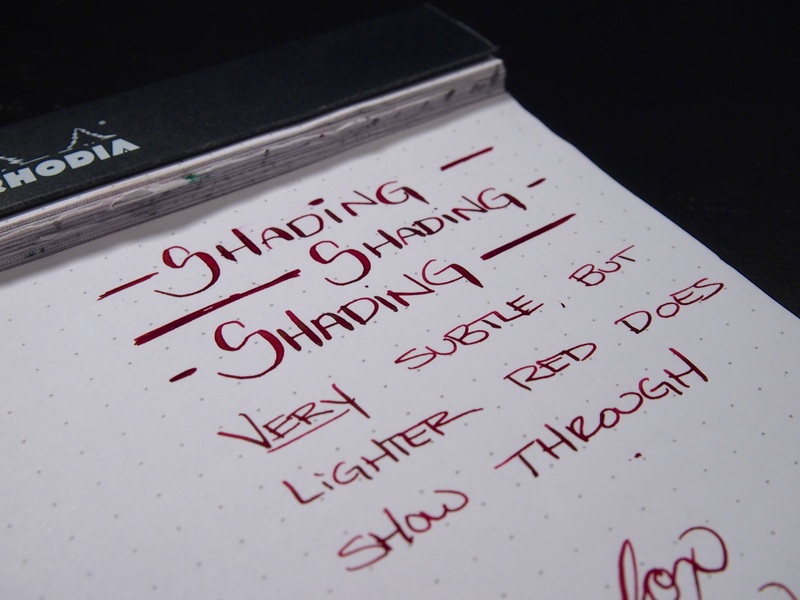 Depends on the nib and the paper, but this ink shades a bit. Not much color variation, but it does have a bit of gradient going on. Have I ever mentioned I love your reviews? 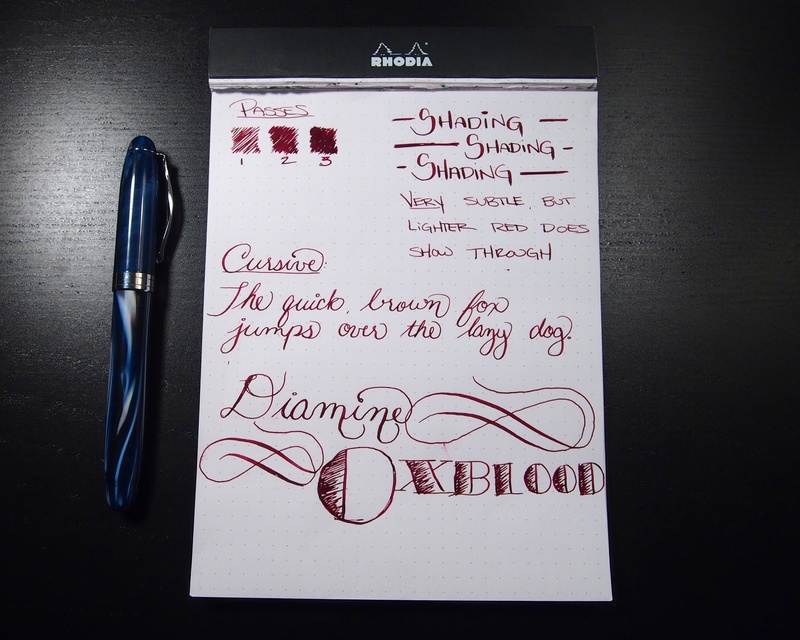 Oxblood is one of my favorites too! 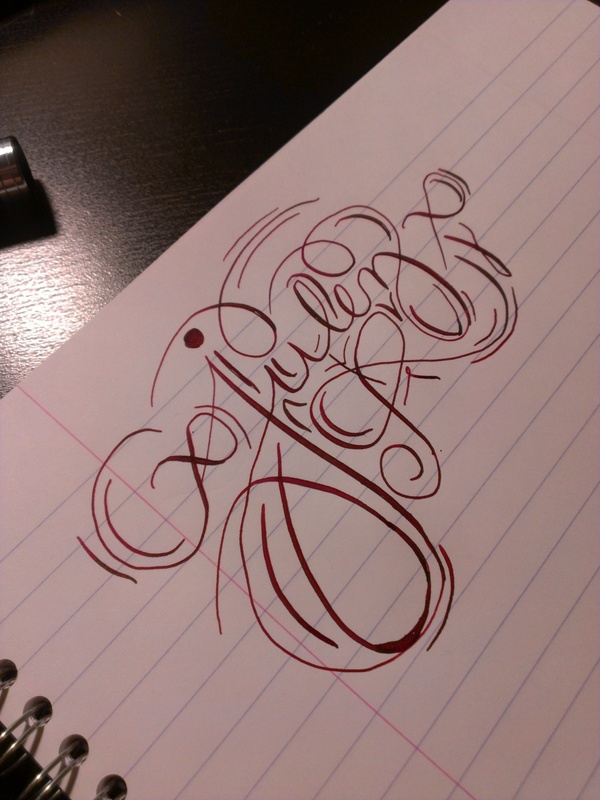 Oxblood is also one of my favourite colours. I love your review style, seems I need to practise more with my Ahab (the photo of yours looks a LOT better than those I’ve seen on the website. Blue is my favourite colour and had I seen this photo I’d have picked this one instead of the King Phillip Purple). Ack, I typed in the incorrect email address, ahh well… too bad it won’t let me edit it. Sorry! Thank you so much! I was really happy with how the pictures of the Ahab came out. I think the best shot of the color of the pen was in my most recent weekly loadout, the blue really pops on the black wood background.